The Impossibles was a series of animated cartoons produced by Hanna-Barbera in 1966 and aired on American television by CBS. 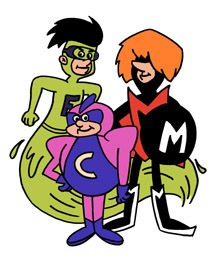 The series of shorts appeared as part of The Frankenstein Jr. and the Impossibles Show. The Impossibles were a trio of Rock and Roll musicians who, when called upon to do so by their commander, "Big D," became superheroes. Like the Monkees, the group’s appearance (in their musician form) was based on 1960’s pop star stereotypes, which included long-ish hair, brightly colored (and matching) outfits, high-heeled boots, and, unlike the Monkees, a lineup apparently void of percussion or bass instruments. Coil Man (a.k.a. Coily) could transform his limbs into impossibly stretchable coils. Coil Man’s guitar contained a receiver through which "Big D" could contact the group. Coil Man was voiced by Hal Smith. Fluid Man (a.k.a. Fluey) could morph parts of his body into a liquid form. Fluid Man was voiced by Paul Frees. Multi Man (a.k.a. Multi) could create infinite duplicates of himself. A physical trait that he shared with many of his contemporaries in cartoons and comics was a mop of hair that entirely covered his eyes. Multi Man was voiced by Don Messick. As musicians, the Impossibles played their futuristic-looking guitars atop an equally futuristic bandstand that could convert into a flying car. It was never revealed how the Impossibles got their powers, how they all met or what their real names were. For the 1979 series The Super Globetrotters, the Impossibles' super powers were re-assigned, entirely intact, to three members of the 'Trotters troupe. The transformation sequences and many of the signature "moves" from the 1966 series were re-drawn, frame by frame, to feature the superhero incarnations of the Harlem Globetrotters basketball team instead of the guitar-toting Impossibles.